Directed by Kensaku Kakimoto. 2012. 28 minutes. Study areas: Contemporary Japanese Culture and Society, Modern Japanese History, Natural Disasters, Tōhoku Earthquake and Tsunami. In the year since the 3.11 Tōhoku earthquake and tsunami, the disaster has elicited an enormous range of human responses: from the worldwide outpouring of sympathy and charitable giving to political protests centered on resistance to nuclear energy, from perseverance in the face of hardship to stubbornness in the face of change, and of course, overwhelming sorrow and mourning. 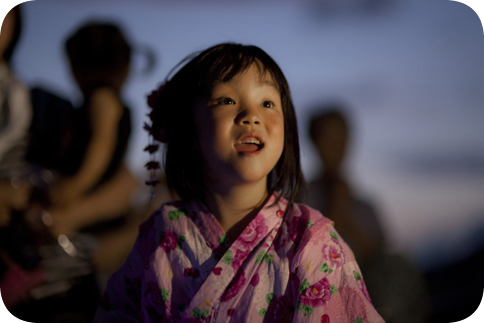 Light Up Nippon, a short documentary film sponsored by the Japan Foundation, tells the story of one of those rare moments of celebration—solemn, yet jubilant—to take place in the months following the catastrophe. “Light Up Nippon” refers to a fireworks display that lit up the sky along 300 kilometers of the Tōhoku coastline on the evening of August 11, 2011, the five month anniversary of the disaster. The film traces the project from its inception just days after the tsunami to its completion several months later, in parallel with the Tōhoku region's progress from utter devastation to the beginnings of rebuilding and a return to some semblance of stability. Shots of the areas most severely affected by the earthquake and tsunami are interspersed throughout the film; piles of rubble, flooded roadways, toppled buildings, and especially the red flags marking sites where bodies were found in the wake of the disaster remind viewers of the stakes involved in the Light Up Nippon project. More than simply an account of the disaster's toll and various efforts toward material and emotional recovery, however, the film focuses most intently on the people who experienced these events. Along the way, viewers meet evacuation center leaders, municipal and prefectural officials, volunteers, students, businesspeople, and others, all of them somehow involved with the project. The fireworks mean something different to each one. Some see them as a means of cheering up the survivors of the earthquake and tsunami, or as a repose for the souls of those who were lost. Others view the fireworks as a summer tradition that must be continued, even—or especially—at a time of such instability. Still others think of the fireworks as a potential moment of normalcy for those whose lives have been thrown into chaos. The film focuses in particular on Takada Yoshitake, who has the original idea for the Tōhoku fireworks display, and leads the project through to its fruition. He sees the fireworks as his own personal contribution to the region's recovery, a moment that unifies people by continuing a custom from the past and encouraging them to face the future in a Japan forever changed by 3.11. This diversity of opinions is particularly refreshing next to mainstream Western coverage of the disaster and its immediate aftermath, which has tended to homogenize the Japanese, characterizing the people as uniformly patient and resilient and portraying the Japanese response to the disaster as uniquely orderly and calm. The strength of Light Up Nippon lies in its multifarious voices. Even as its close, personal focus on Takada's emotions avoids a universalizing narrative, the film introduces a number of distinct experiences and reactions to both the earthquake and the Light Up Nippon project. In fact, Takada's idea initially meets with a great deal of resistance. Although the film celebrates the efforts of those who enthusiastically moved the project forward, it does not silence the voices of those who expressed reservations, feeling that such an upbeat event was in poor taste at a time of mourning. If there is an aspect of the post-3.11 Japanese landscape that is ignored in Light Up Nippon, it is that of the political. The film avoids coverage of political and anti-nuclear protests, and even sidesteps the human-caused element of the disaster, the meltdown at the Fukushima Daiichi nuclear power plant. While this allows the documentary to distance itself and the Light Up Nippon project from the more divisive elements of 3.11, it does leave a conspicuous absence in the film's narrative of the events following the earthquake and tsunami. Tellingly, the only connection the film makes to the nuclear disaster is its inclusion of the unmistakeable image of the damaged reactor buildings of the Fukushima Daiichi plant in its opening montage, a series of clips presenting the scope of the damage to the Tōhoku region. Whereas the preceding clips are narrated, the plant images are accompanied by pregnant silence. Light Up Nippon would be ideal in undergraduate classrooms, especially as a complement to other materials treating the events and issues of 3.11. It could be used in courses on contemporary Japanese culture and society, or even modern Japanese history, into which the Tōhoku earthquake and tsunami are irreversibly etched. Cindi Textor is a Ph.D. student in the Department of Asian Languages and Literature at the University of Washington, studying modern Japanese and Korean literature. She holds a Master of Arts in Asian Studies from the University of Illinois at Urbana-Champaign. Light Up Nippon is distributed by The Japan Foundation.